This officially licensed Disney Minnie Mouse Inflatable Moonwalk is sure to be the hit at any ones special event where their are Minnie Mouse fans. This officially licensed Disney Minnie Mouse moonwalk is resembled after Minnie’s Bowtique and is sure to be the talk of any event where there are Minnie and Daisy fans! Monkey Business Party Rentals invites you to experience the Minnie Bowtique first hand by calling 205-960-7117. 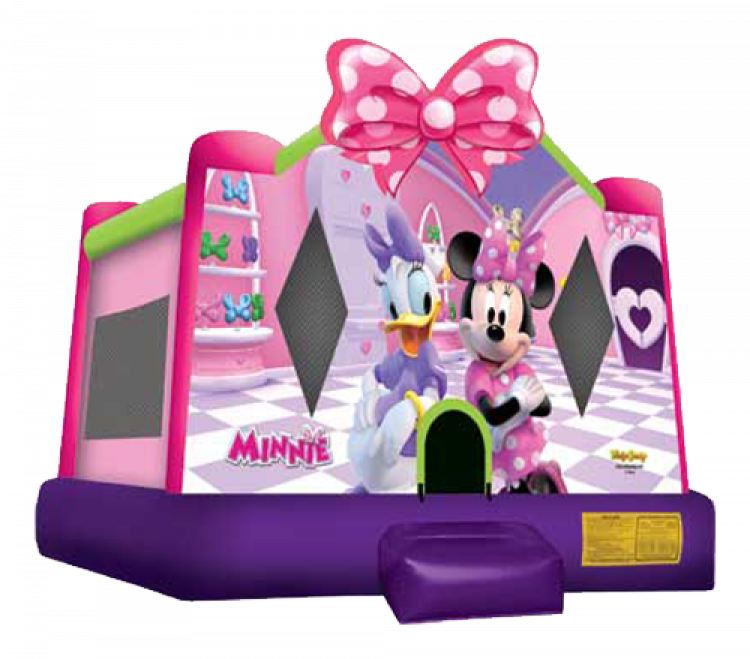 The officially licensed Disney Minnie Mouse Inflatable Moonwalk / jump house is available to request for your special occasion and among a favorite for birthday parties. Monkey Business Party Rentals is Birmingham’s favorite rental company for inflatables like this officially licensed Disney Minnie Mouse moonwalk shown here. We also have many other officially licensed inflatables including jump houses / moonwalks, combo units, obstacle courses, slides, and water slides that can make your party a great success! Monkey Business Party Rentals also rents tables, chairs, tents and linens. We have an event planning specialist available by appointment to discuss your upcoming special occasion. Located in the Riverchase area of Hoover, Alabama we are centrally located in the Birmingham metropolitan area and have a wide range of delivery areas to service your party rental needs. Monkey Business Party Rentals strives to provide the newest, safest and cleanest inflatables that can be found in Birmingham, Alabama. Our event specialist, delivery drivers, set up team and customer service reps are highly trained and knowledgable to ensure your event is a huge success. 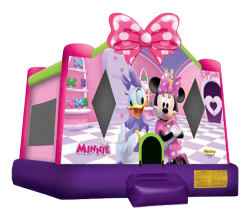 Monkey Business Party Rentals located in Hoover, AL is excited to offer this officially licensed Disney Minnie Mouse moonwalk / jump house and appreciates the opportunity to service your next event. Birthday Parties are special memories and this Disney Minnie Mouse moonwalk is sure to leave lasting impressions on all who attend. Call Monkey Business Party Rentals to reserve your officially licensed Minnie Mouse moonwalk today!